The Arc4 Series of Panasonic men’s electric shavers delivers close, clean, quick shaving with four ultra-sharp stainless steel Nanotech blades, each precision honed to a perfect 30° edge, plus an ultra-thin ARC foil system that gently conforms to the individual contours of your face, neck and chin. This men’s razor includes a flexible pivoting head to glide blades and foil effortlessly along the skin for maximum comfort. Its high-efficiency 13,000 cpm linear drive motor maintains full, continuous power to the very end of each battery charge for consistent, even shaving. A built-in pop-up trimmer adds the perfect finish to beards, mustaches and sideburns. It’s 100% waterproof, too, and can be used with foam or gel in the shower or used dry anytime. A 10-stage LCD shows battery status, charge indicator and cleaning and replacement reminder for blades and foil. Cleaning is quick and simple. Just rinse the electric razor under running water to easily remove stubble. 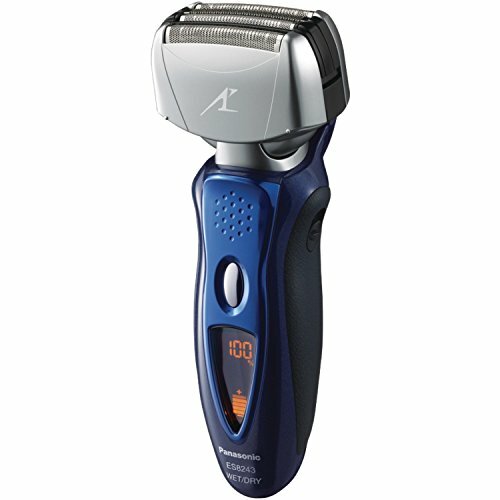 And for shaving away from home, this electric razor comes with universal voltage, AC adaptor/charger and a travel pouch.